The rickety bus stops in Salloum, a small town in the far west of Egypt. From here private pick-up trucks shuttle passengers further up the mountain to the Libyan border. Although we have overstayed our Egyptian visa for a few days we pass immigration without any questions and are suddenly almost alone in a stretch of no-man’s land. In a solitary building that screams “Duty Free” in huge blue letters from its wall, a fat man in a chequered shirt shifts huge boxes marked “Wellington” around an otherwise empty storage space. “Hello! Come in!” he waves friendly. Wellington, a local cigarette brand? Egyptian vodka that has escaped our attention so far? We wave back and proceed westwards. At the Libyan side of the border, throngs of men, most of them Egyptians, stand about in groups, pushing and shoving. Some fat old Berber women in colourful clothes with tattooed faces who carry their bundles with cords strung around their foreheads get passed through quickly. The Libyan officers wearing gangster-like black leather jackets and slick sunglasses curiously inspect our passports and lead us to yet another office until finally we get the important entry stamp. Our ten day transit visa gave us just enough time to rush along the 2000 km long coast, visiting Cyrene, Apollonia and Tolmeita in the East, as well as Leptis Magna, Sabratha and Tripoli in the West. “Not much to see! Meet me here in 1 1/2 hours!” Hussein works for the tourist police in Cyrene and Apollonia, two ancient Greco-Roman sister cities. He has offered to take us in his official car to Apollonia, the harbour town that cannot be reached by public transport. While we gape at dozens of marble columns, a complete Roman bath and three early Christian churches, Hussein spends some time chatting with the guard posts and then comes over to show us the path to the theatre hewn into the cliffs. By Libyan standards, the site is indeed not big, but 1 ½ hours are barely enough to look around. Enough, though, to get a foretaste of the splendour that awaits us. 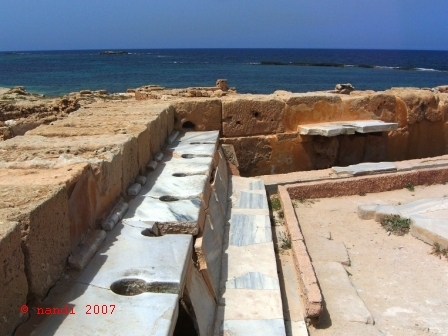 The undisputable highlight in Libya was Leptis Magna. Founded by the Phoenicians during the 7th century BC it later became a Punic city and finally part of the Roman Empire in North Africa. When the Leptis Magna native Septimius Severus was crowned Roman emperor in 193 AD he treated his hometown to some of its most spectacular buildings, among them the New Forum and the Civil Basilica. In its time, the Basilica must have looked like a top-class mall with galleries for the women on the first floor and marble statues and inscriptions everywhere. It was only in the 4th century that the multipurpose meeting hall was converted into a Christian church. Today, pillar fragments and Corinthian capitals are strewn on the floor. An elderly Swiss couple enjoys their lunch break. Sitting on a fallen column they eat one banana after another out of a blue plastic bag. Then they look up the next monument on their itinerary in a thick book with a strong green cover and a library signature and continue into the direction of the Old Forum. This confirms our own experience. At least we had no difficulties visiting ancient sites, using public transport, stopping in villages or talking to people. We could easily get an extension of our visa in Benghazi. The Libyans were very friendly and open-minded. As not many individual tourists make it into Libya, they were curious and eager to speak with us. Different from all the other Arab countries we visited, nobody ever talked about politics, let alone the president. Not even the owner of the small shop where Natascha bought a souvenir Gaddafi watch. “Schengen passport?” Hassan, the driver of our shared taxi, decides to try his luck in the fast lane to the border checkpoint when we produce our red European passports. But the tourist police are in their lunch break and when they come back, the officer has trouble finding the Libyan visa. Haven’t we overstayed? We point vigorously at our visa extension stamp. “Here! Passport Office! From Benghazi! No problem!” While we wait for the border officials to discuss our case, the daily smuggling drama at the Libyan-Tunisian border unfolds around us. Old men carrying enormous bundles of sneakers, towels, baseball caps etc. are coached and guarded by younger men in Jeans. Their aim is to pass the Tunisian customs officers with their goods destined for the Tunisian market. From time to time the whole group moves forward with the younger men trying to open a passage. As in a game, the customs officers sometimes randomly grab an old man and cut his bundle open, spilling the wares on the tarmac. Sometimes they deliberately turn around and let a few people pass behind their backs. After about 30 minutes the officer comes back with our stamped passports, and ten minutes later we are in Tunisia.